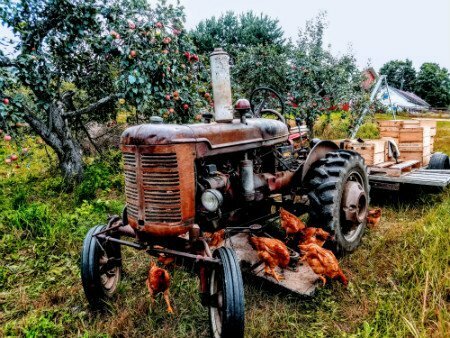 Grandview Orchard uses regenerative agriculture practices to produce our products completely free of synthetic chemicals while always improving the soil. This style of ecosystem management is a very challenging approach which is a constant learning process. Instead of the monoculture system typically used in orchards, diversity of plant and animal species both above and below ground is absolutely vital. 2019 marks the fourth year of Grandview’s regenerative production practices and progress is slowly and surely happening! You can rest assured that our apples, apple products and orchard-raised meats are nutrient dense and free of harmful residues. We believe that “organically” raised food should be easily accessible and affordable. As Grandview works towards a more closed-loop system, we continue to improve on the orchard’s reduced needs for outside inputs while producing a more nutrient-dense product. This is the hallmark of regenerative agriculture. Every product or input that is ever used in agriculture has consequences beyond the desired effect, so we try our best to make those positive.